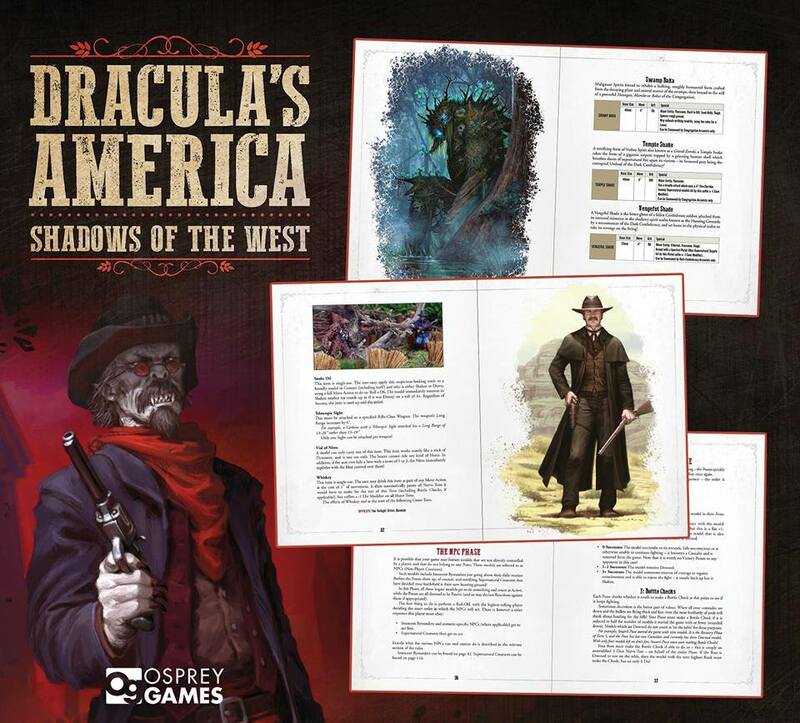 Last Autumn Axiom/Magpie and Old Lead mentioned that he had played a game of Draculas America: Shadow of the West, a recent release from Osprey and North Star. I didn’t particularly want to get involved with an untried rule set, but backshootin’, yeller-belly Axiom gunned down my resolve in cold blood by reporting back and saying all the right things about how the game mechanics worked, so I picked up a copy. The book is a hardback slightly larger than A5 and looks just as nice as expected for an Osprey rulebook. Like the Frostgrave equivalent, the DR rulebook is full of beautiful illustrations and photos that capture the vibe really well. Most importantly of all, there is a fun ruleset in there too, ripe for the sorts of skirmish games and painting projects that I favour. The setting for Dracula’s America is an entertaining, alt history, late 19th century gothic Western affair. Without changing any rules, I decided to transplant the game into a post-apocalyptic, weird-space-western setting – essentially a mix of Necromunda, Firefly, Brave Starr and Mad Max. I have a few reasons for doing that, but primarily it’s because a setting like that suits my existing miniatures and terrain. Mark Gibbons Ratskin illustration. As far as I can remember, this image was never published. While all of this was happening, the new version of Necromunda – a game with more than a bit of wild west influence nestling in the grimdarkpunk – was released. My fondness for the setting of that game is something that I will talk about at a later date, but the short version is that I love it. Therefore painting the Ratskins that I have had sitting around unpainted since the nineties for use as both a Necromunda Ratskin gang (obviously) and as a Draculas America (in Spaaace) Skinwalker Tribe made loads of sense. With the exception of the (mildly) science fiction weapons and the wearing of R.O.U.S. pelts, the lovely 1990’s Perry Ratskin sculpts look relatively primitive: they dont have very many obviously high tech trappings. Part of the enjoyment of this project was working out ways to paint the figures in a way that lent them a more futuristic (or at least less historical) vibe, while also keeping them looking vaguely Wild Western… and grimdarkpunk. …and some have to look like they magically turn into animals. I forgot to mention that. You could even call it a techno-tribal, positively primal, shamanic, anarchistic, archaic revival of my old miniatures, if you were inclined. About half way through the process of painting the Tribe of the Boss Drum, I decided that the colour scheme wasn’t working out quite well enough. The earthy green in the trousers was forcing my hand with the other palette colours somewhat. Some helpful advice from Curis/Ninjabread led me to painting elements the force in two of the same colours that I have been using almost constantly for two and a half years: purple and green. I had wanted to avoid those two colours in particular, but I think that it worked out here, which is the main thing. I considered using varied skin tones for these guys as I have with a lot of projects recently, both for additional “realism” (whatever that means in this context) and because it makes painting more interesting, but decided not to. I was unsure about how the final palette was going to work out and I didn’t want to add more colours into the mix. As a culturally isolated group, painting the entire tribe in the same skin tones made sense anyway. I varied the hair colour a little to hopefully avoid the figures looking too similar en masse. L to R: Mister C – Shaman, Warrior. 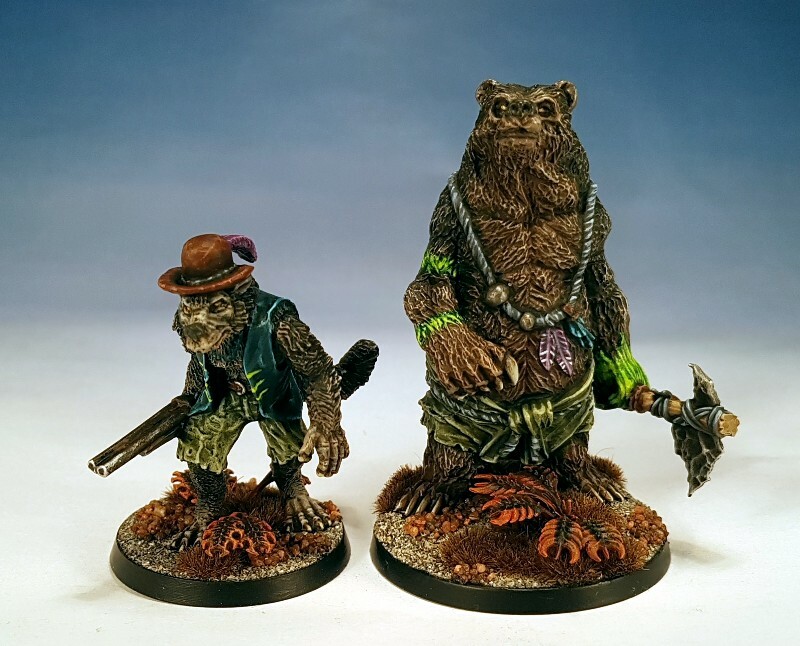 Although I’m sure that there must be some out there, I don’t recall seeing Ratskin miniatures wearing anything but dark brown or black rat pelts. 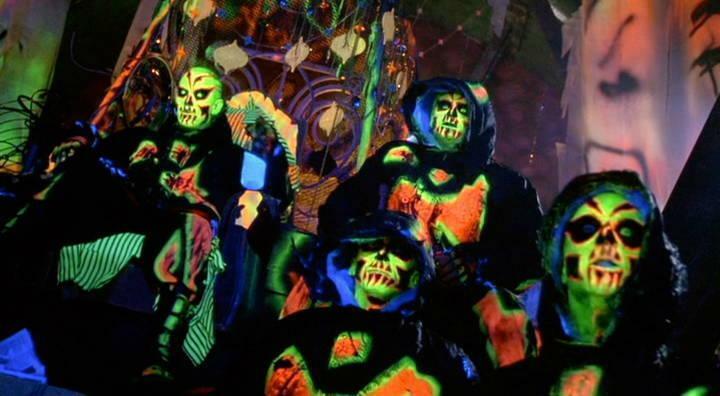 Way back in the 1990s when I first bought the gang I planned to paint the pelts white, like lab rats, just to be a little different. The pelts worn by the Boss Drums are a little grubbier than a laboratory condition rat hide, but it was fun to stick to that part of my original Ratskin plan from nineteen-ninety-whenever-it-was. 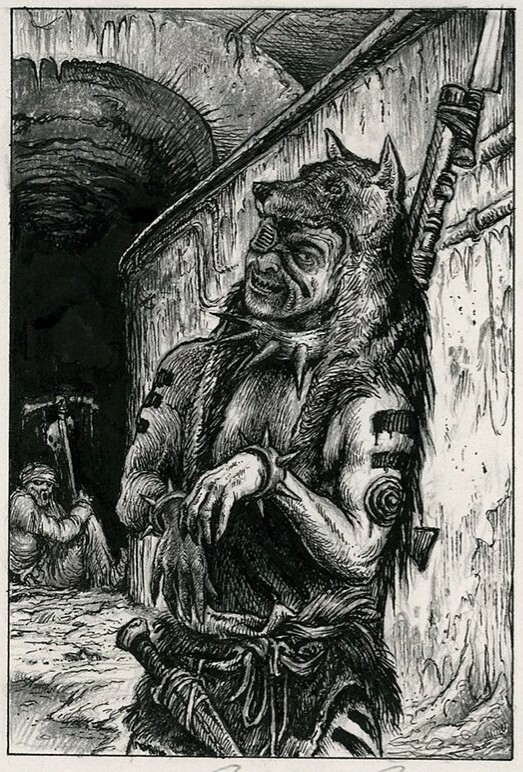 The distinction between the “Warriors” (rat pelts) and the “Braves” (bare chested) doesn’t make any difference in Dracula’s America games, but serves as a visual aid in Necromunda games. 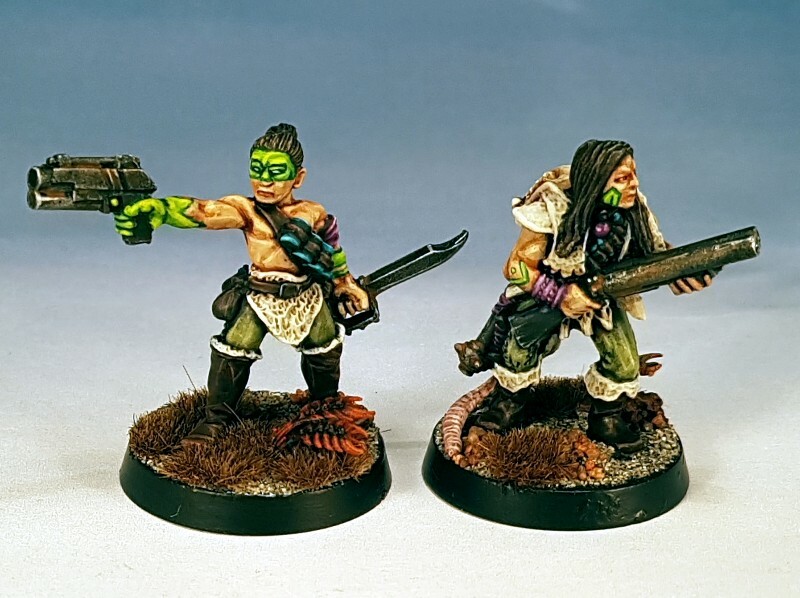 I really do like the sculpts for both varieties of model in the tribe, each for their own reasons. Mid 1990s Perry sculpts are right up there with my very favourites to paint. I have only named a couple of the members of the Boss Drums so far. I generally don’t name my skirmish game figures until they do something memorable, or gain a skill. In a faux Native American context, popular culture deems this approach even more appropriate than usual, so I will stick to it: the Drums will be given War Names as they progress. Last but certainly not least, the Skinwalker Tribes in Dracula’s America are shapeshifters: some of them can turn into wolves or bears, which need to be represented on the tabletop. 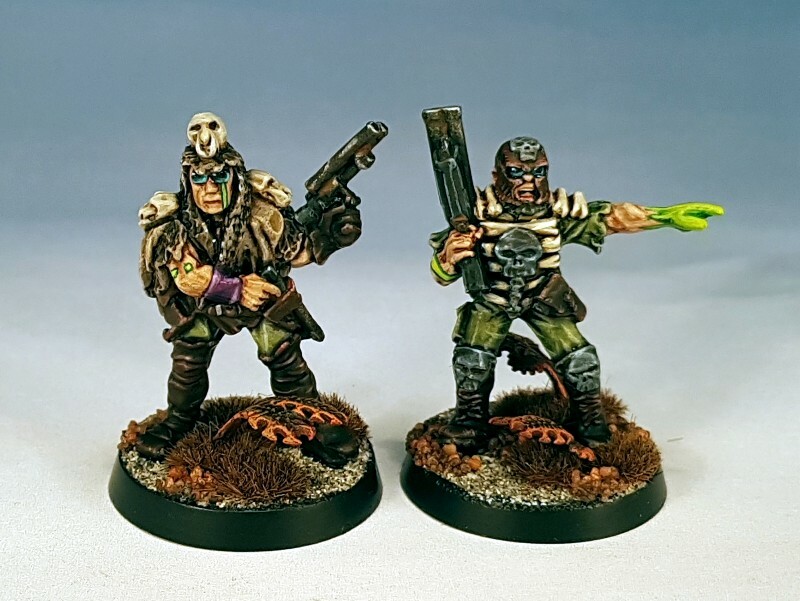 This allowed me to dip into the handful of oddball Confrontation – the precursor to Necromunda – miniatures that I have had knocking around for a while. 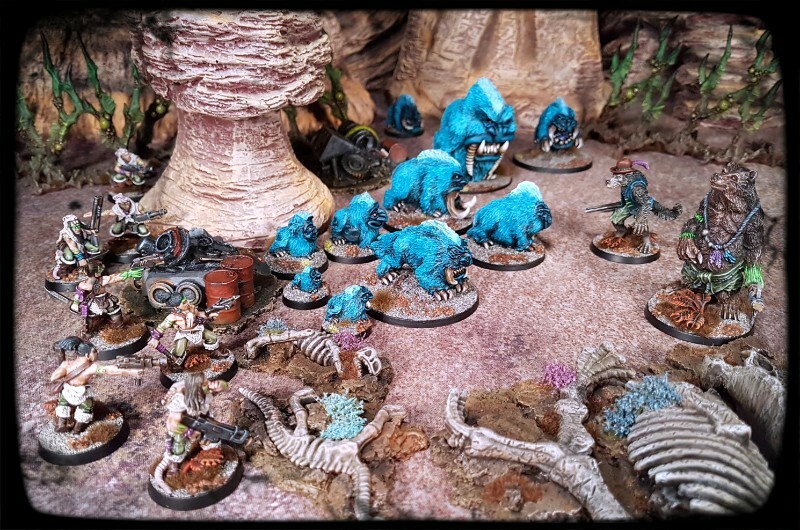 The Ratskin concept in Necromunda almost certainly developed out of the “Dogskin” concept in Confrontation. With that in mind painting my single Dogskin miniature to represent a Skinwalker made loads of sense. I also had a Confrontation “Hunter” which, due to his bone fetish covered armour, I figured would work out well as the second skinwalker model that I wanted to be able to field. Plus rolling those old Confrontation models into a Necromunda gang had a pleasingly retro feeling to it. 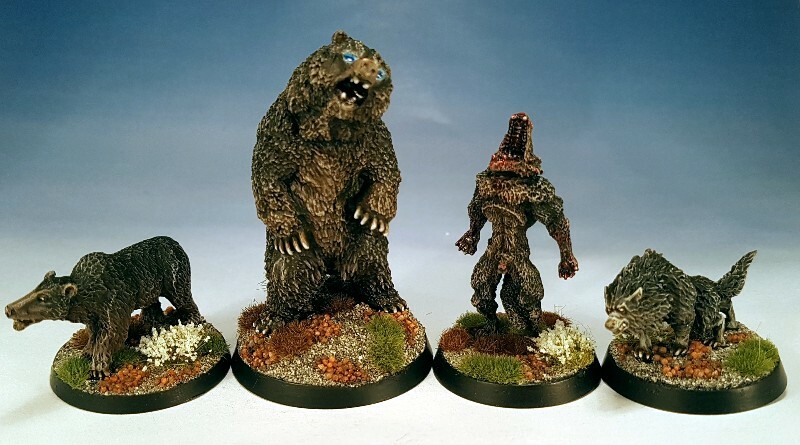 I used a pair of Reaper Bones miniatures to represent the altered beast forms of the Skinwalkers. They are big, chunky types and, particularly in the case of the bowler hat wearing werewolf, a little comical. While I was quickly painting fur, I decided to add four other wolf and bear themed models to the batch to paint alongside. I tend to paint fur with a lot of drybrushing and washing that lends itself to batch painting – its nearly as fast to paint a handful as it is to paint one, so that’s what I did. Regular readers may recognise the werewolf that I bumped up the project queue for last Halloween. I have picked up a few more figures to complement these guys, from a variety of sources. Some are already painted and will be in follow up posts at some later points. Hunt was good this day. Many blue pieces of evening wear were made. I also have plans for a few more forces for both DA and Necromunda, although I’m not sure how many will map on to both games as neatly as these miniatures do. Tehy’ve taken their time but they were definitely worth taking time for. It’s a bucket list rampage you’ve accomplished here. 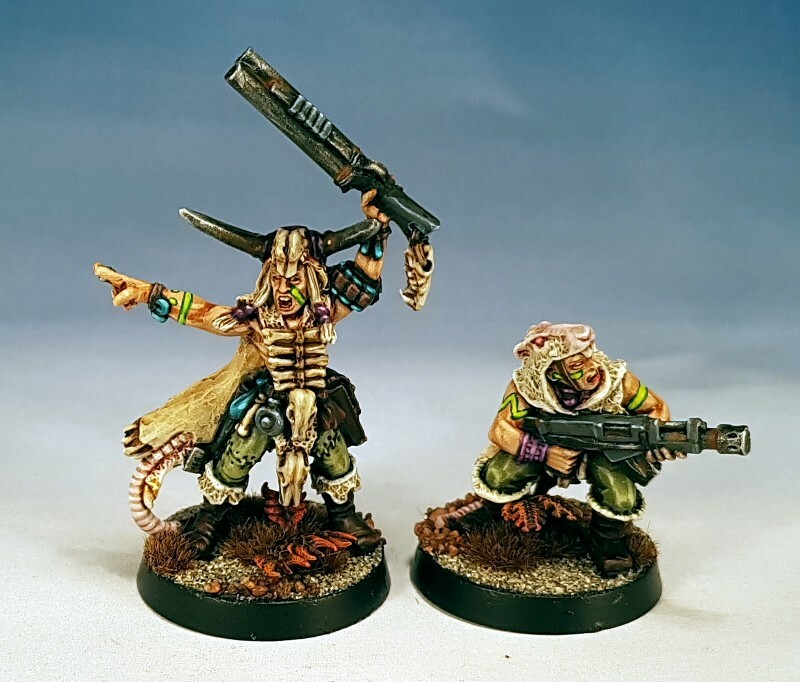 Technically its my first ever properly finished Necromunda gang, which is both slightly shameful in some ways, but also a really satisfying thing to have achieved at this point. It’s like a tribe of skin-wearing wierdos have suddenly pitched camp in the park over the road – first they weren’t there, then suddenly they were ALL there! With tents. And dogs. And weird bits of meat being cooked over smoky fires. 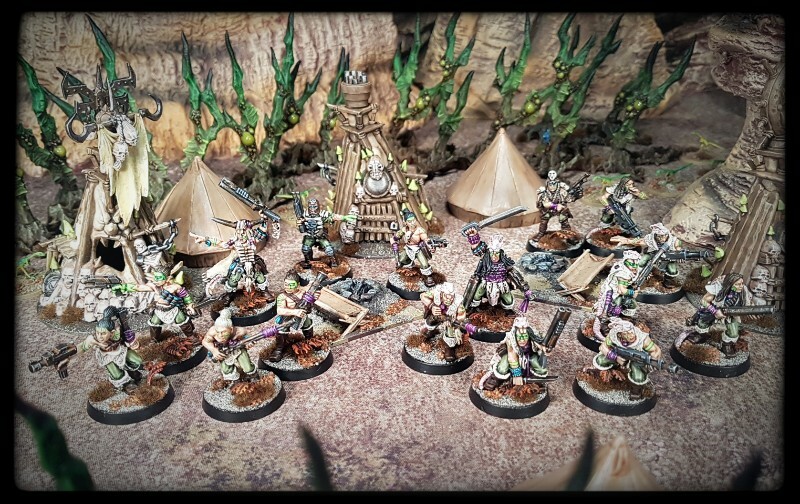 You’ve ambitiously set yourself so many criteria for this group of figures, it boggles my mind that you’ve actually ended up with a beautifully painted, unique, eye-catching, coherent and game-flexible tribe. I would like you to add a rat-wrangler with some semi-domesticated pale-furred rodents please. Is there a miniature of Crispin Glover’s Willard out there somewhere…? I never even heard of that movie Cap. I will have to keep an eye out for it. I actually even included a a couple of dogs. I should have added some twine. Thanks for the very nice compliments on the work Axiom 🙂 There were ups and downs with them, but I am pleased with the finished product. Hopefully the image below puts youir mind at ease re rat wrangling. Great now I’ve got that goldarned Pinocchio song in my head… why, just why?? I’m still not 100% convinced about the hat wearing wolf to be honest, but I’m being too precious I think. The figures themselves should port through a number of gaming settings or subsettings I think. Thanks for the feedback Cap! 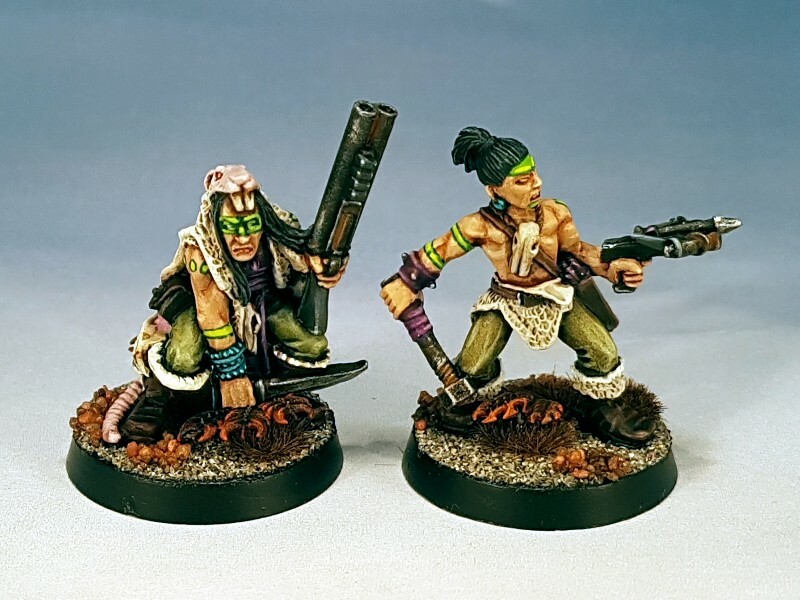 I absolutly love the ratskins – they look like a cross between Adam and the Ant and Mad Max, with their flamboyant make up, posh White pelts and general barbarian feel. Excellent! 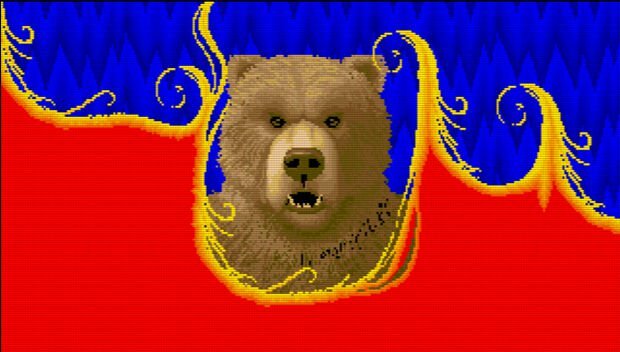 The bear with the pickaxe is top notch too. So cool. I’m glad that you like them Thomas. I am still enthusiastic about the force, even after putting in the graft to get them painted. I’m very much looking forward to getting them on the table. Nothing short of glorious here. They look so nice that they make me happy simply by existing. Some of your best stuff yet! Some of my best you think, hmm. I dunno. Maybe. A clash with your Congregation force at some point in the future perhaps? Space Western is a genre that I come back to every so often and regularly wonder why the hell I left. You should treat yourself to some of those Ratskins. Mid 90s Perry sculpts are just lovely. If you haven’t checked it out, you NEED to read the comic East of West. It is very much in line with your setting. I have been reading the first book recently as it happens. It has yet to grab me, although I love some of the ideas. Hopefully it will all “click” soon Andrew. Nicely done. They look really cohesive and worth all the effort. You’ve given me ideas about going back and getting my digga’s done now. The warpaint in these guys is very like the Digga warpaint shown on the various GW studio illustrations and miniatures back in 97/98. So much so that I decided recently that I didn’t want to own Diggas AND Ratskins, so I traded the Diggas away. Reluctantly I might add, the Diggas are great sculpts. You will do a great job on them. A very ambitious project which you’ve pulled off with aplomb. All of the sudden you have a very generous set of future tribal dystopian primitives at your disposal. With accessories. They look excellent, nicely done indeed. Its funny, but you spend your whole life talking about future dystopian/post apocalyptic primitives, what you like about them, what you dislike, what they wear etc etc, but you don’t actually get around to painting any until you are in your forties. Bizarre really. But as you say, they are ready to go now, which is bucket list-tastic. They should be facing off against your Tong in the dusty streets of Standard Falls and the blasted wasteland of Uncanny Valley in the very near future I hope. Awesome post with a catchy track to accompany the read. I really like the list of criteria of what you wanted to do with the figs. Do you clearly articulate these goals before you start painting? Or is a bit more vague and firms up as you go? It seems like it would be a valuable technique. I also appreciate how you have pulled in some other figs which wouldn’t at first me obvious additions (the beastmen). Thank you DaveB, Im glad that you enjoyed the post (and “Boss Drum” is an earworm whatever you may think about it). I tend to ponder on my projects a bit, and engage in the projects that I feel that I have had a good idea about executing. I tend to let the inspirations drive the project list. I record ideas that I have about projects in an app (Trello), so I end up with a lot of project ideas recorded, while far fewer actually get from the “drawing board” to finished product. These are all just guidelines that firm up as I go though, they change due to contact with reality and in larger projects, they often refine. So I suppose its pretty organic really. The most important factor for me is always how I plan to actually paint the models. There is zero point in identifying a colour scheme that will be a massive pain to execute. Trying to minimise panting time while still getting a standard that I can be happy with is probably the element that defines my projects most. Yes, quite a helpful ramble. I try to write down some brainstorming ideas on everynote, but i’ve found that I have so many notes it sorta gets lost. Easier to use for recording painting recipes as I can search for specific things. Maybe I’ll check out trello. Su-flippin’-purb mate – I absolutely adore this group. 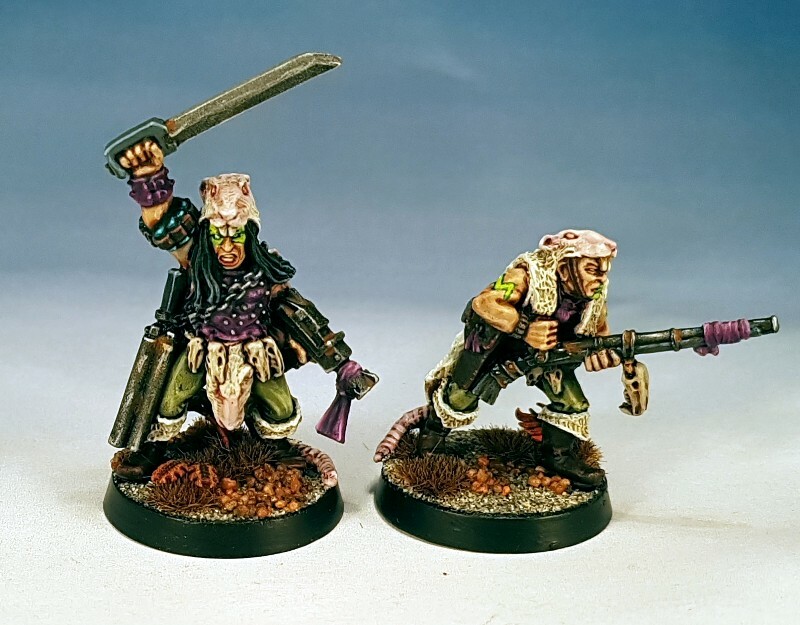 To tick all of the boxes that you wanted to tick without making them look confused and conflicted is nothing short of genius… best M&S (these-are-not-just) Ratskins ever? Hell yeah! I did manage to keep a few balls in the air for this one, Im quite pleased about that aspect. You will hopefully see them at BOYL this year. Axiom is running a space western sort of game. Stunning and coherent set, and some good choices to pad out the core gang. I can’t believe I’ve never thought of white pelts before. 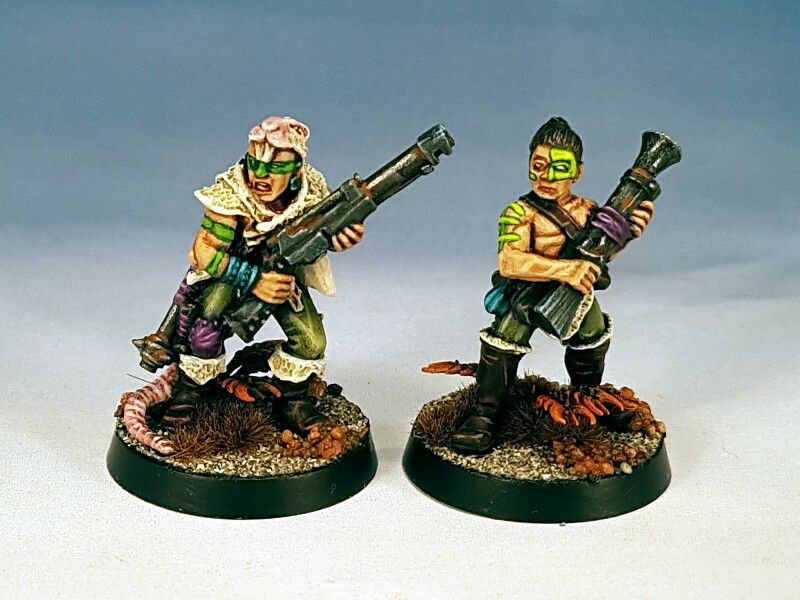 These rats are living in the dark of the underhive – makes perfect sense as well as looking good. The wearers of the pelts could plausibly be painted as albino humans for similar reasons too, which would be a good look I think. I really like all of the explanation about your thought process. Not just the painting, but how you build the background for them. It’s so complete it’s like you could just suddenly break out into a 5 minute monologue on the Ratskins while hanging out a the bar pickin’ up chicks. ’cause we all know chicks dig that…. Heh, oh I could, I really could, although generally it isn’t my go-to approach when cruising. I do enjoy getting a bluffers guide level of learning about a related topic when working on associated miniatures though. Accordingly, while painting the tribe and thinking about “Dracula’s America” in general I have been watching and listening to various shows on the Wild West. I didn’t watch terribly many westerns when growing up and my US history knowledge was essentially non-existent, so I am enjoying learning a bit more about it. Thanks for the input Will! Wow. Just wow. What a fresh take on these! I never thought they could look so great! Clap clap clap clap! In some ways I think that I should in fact have been more extreme with how I painted these, made them slightly less “earthy” in tone than they are, but I wanted them to echo *actual* Native Americans too, so the tones had to be be a little less saturated in places. I haven’t sold/traded many items over the years, but some of the ones that I have still bug me a bit. I’m sure that there will be nice, new plastic Ratskins along in a couple of years. They might be an option perhaps. Great work here. 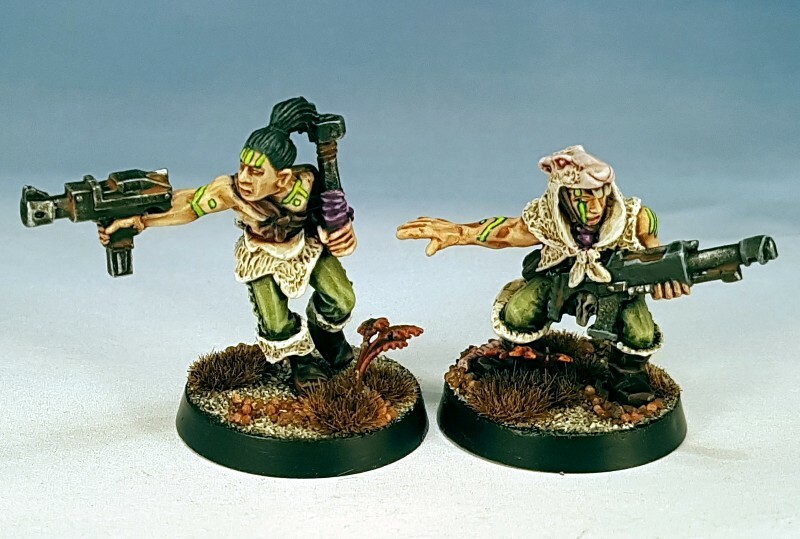 And now you’re overtaken me in Necromunda too, by having a full gang painted. Love the palette. It really does manage to hit so many of those visual beats you were after. I managed to slip responding to this Azazel, sorry. 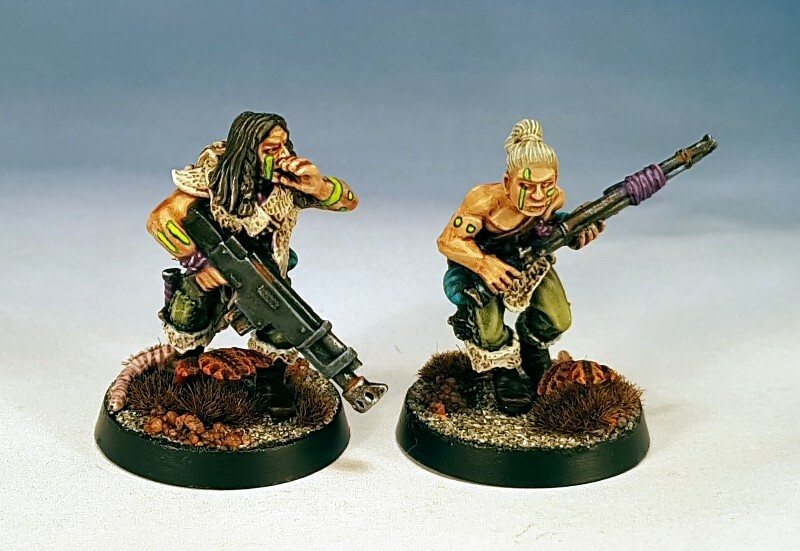 I may have overtaken you in Necromunda, but every time I look at my phone you seem to have something new painted, photographed and blogged, so no fear of me passing you out overall… not a chance. I’m glad that you reckon that the Ratskins worked out. I slightly wish that I have painted them a little more saturated, but ho hum. It still works. I’ll use the more extreme colours with the next gang instead. Thanks for the kind words Azazel. Man that’s a lot of work. Visually spectacular! It was a significant bit of work, to be fair. These look fantastic! I was already interested in Dracula’s America, but porting it into space is even better. And double purposing for Necromunda is genius. I’ve not been following my oldhammer blogs for a while, I’ve got some catching up to do. The DA setting is really great, but I wanted to make as many of the models and terrain pieces that I already own tie in to the project as possible. Resources, both cash and time in particular are limited, so a little bit of overlap makes sense for me. Brilliant work as always! Love this style of setting, ties into the whole Deadlands Weird West/Hell on Earth that grabbed me as kid. Such a fertile gaming enviroment! Weird West has amazingly broad scope, for all sorts of reasons. Like you, there is something that I find almost magnetic about the setting. Stick a cowboy hat on so many of my favourite horror, post apocalyptic and sci-fi tropes and I’m almost certain to enjoy it. Im not even that sure why, as the Western genre was not really something that was into as a kid. Thanks fo rthe kind words Wailslake!